Good City, The Last Mile, 2015, Chicago. Courtesy of Archeworks. 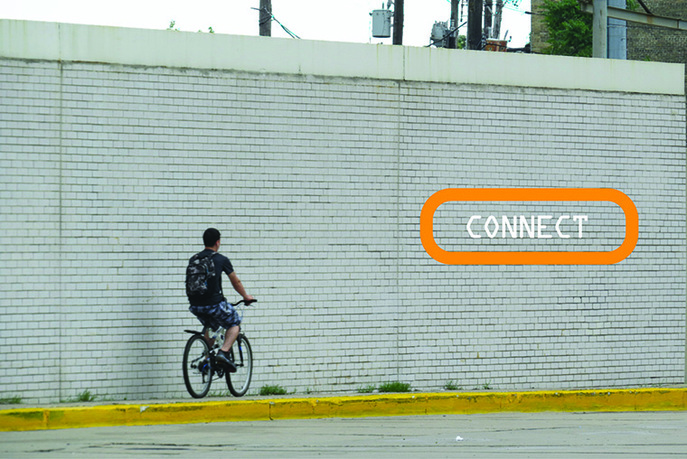 To support community building, encourage the use of public transit, and strengthen cultural stewardship and community livability, The Last Mile develops meaningful public engagement and placemaking experiences in Jefferson Park and Forest Glen, adjacent communities at Chicago’s edge. A week-long installation near a major transit hub transforms public space into an immersive environment, engaging commuters and residents alike. 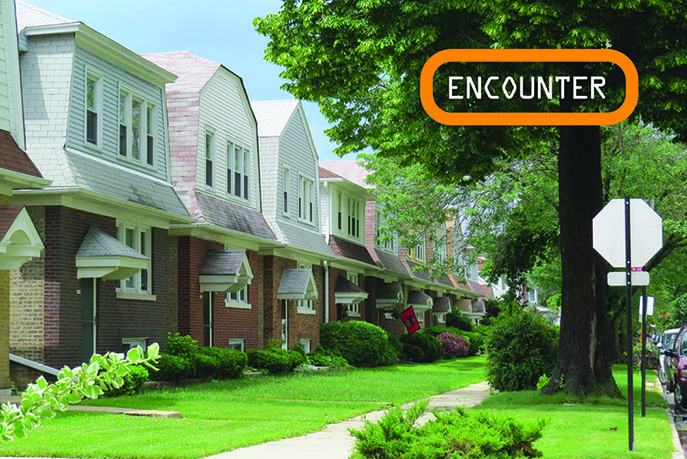 The installation captures and displays community memories, ideas, stories, and historic narratives. 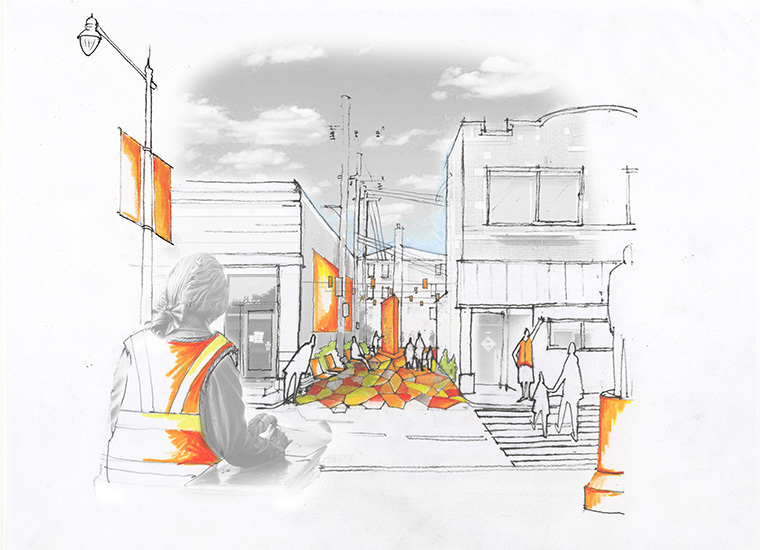 Additionally, a cultural heritage and wayfinding design initiative engages residents in participatory workshops to create culturally rich neighborhood walking and biking routes—transforming last mile commutes to and from stations into enjoyable cultural hikes. Andrew Balster is a Chicago-based leader operating in the fields of architecture, urbanism, public policy, sociology, and academia. Working closely with influential leaders in the public and private sector, ranging from architects and planners to government officials and social activists, he creates research platforms with universities to explore many forms of cultural production. In practice, Andrew has worked on projects that are broad in typology and scale—ranging from small civic centers to super-tall towers to entire urban districts. Balster was a senior designer at Skidmore, Owings & Merrill (SOM) in Chicago on several award-winning projects located all over the globe. He received his MScAAD and MArch with distinction from the University of Edinburgh. Balster joined Archeworks as executive director in February 2015. Susanne Schnell is an entrepreneurial leader who develops urban design and civic partnerships to support community development, health and wellness, and cultural stewardship. She served as Archeworks's executive director from 2009 to 2013. Previously, she played lead roles in strategic planning and program development to launch the Historic Chicago Greystone Initiative and the National Public Housing Museum. She has held prior project management positions with the Civic Committee, the Chicago Architecture Foundation, and the Civic Consulting Alliance. She also served for four years as adjunct research faculty at the University of Illinois at Chicago's City Design Center. Odile Compagnon is an architect and a professor at the School of the Art Institute of Chicago. For her, a vital aspect of sustainable design involves weaving a network of knowledge, experience, and connections, so that endeavors in one arena become sources of creative solutions in another. Her work with theaters has permeated her architecture practice, which she sees as a collaborative effort, allowing for many voices to be heard, leaving some space and time for the unpredictable. Michele L. Larimer brings over a decade of leadership experience in focused community outreach, planning, and implementation. Her dual master’s degrees in urban design and urban and regional planning, combined with proven skills as a leader in nonprofit, small business, and urban planning industries, allows her to be both a creative and strategic decision maker. She directs complex projects, bringing diverse stakeholders to consensus, manages teams, secures pro bono services, and builds partnerships with agility, ease, and satisfaction. Hennie Reynders is an architect, urban researcher, and associate professor at the School of the Art Institute of Chicago. His work focuses on spatial relationships in the urban field, disruptive interaction, and the relationship between social and physical infrastructure across all scales in the expanded field of architecture. He has exhibited and lectured in the United Kingdom, Japan, Switzerland, South Africa, and the United States. Kevin Henry is a product and interaction designer, educator, and author interested in the intersection between design, technology, and culture. He has collaborated on the design of exhibitions and catalogs for topics ranging from contemporary notions of play to artist's books and do-it-yourself culture. He is the recipient of an IDEA Award and a Good Design Award and is currently developing an interactive workbook for the Apple iPad to accompany his textbook, Drawing for Product Designers. A web designer and design researcher since 1994, Paul Baker has been an open-data activist since 2008. He is one of the founders of OpenCity, a nationally known volunteer group of open-data designers and developers. His recent accomplishments with Webitects include developing websites for resident-written neighborhood news with SmartCommunitiesChicago.org, and developing SchoolCuts.org, during the historic closing of fifty schools in Chicago Public School districts. Kate Keleman is a public engagement specialist and exhibitions planner who previously worked for the Chicago Architecture Foundation. She develops fun, thoughtful, outside-the-box exhibitions and public engagement projects that inspire people to discover and discuss the world around them. Her specialties include uncovering stories contained within our environments and writing clearly and cleverly for broad audiences. She received her MS from the School of the Art Institute of Chicago and her AB from the University of Chicago. Kindy Kruller oversees planning studies, masterplans, needs assessments, and land-use policies for the district. She also supports staff on public facilitation, integrated design processes, and sustainability initiatives. Kindy has over ten years of professional experience in planning, land use, and sustainability. She holds a master’s degree in urban planning and policy from the University of Illinois at Chicago. Benet Haller reviews large development projects within the city, leads city-wide planning efforts, conducts design review, and works with metropolitan planning agencies to ensure planning policies promote reinvestment in the central city. He notably managed the development of the Central Area Plan, which will provide a framework for the development of Chicago's downtown for the next twenty years. Previously, Haller worked as a planner, architect, and in non-profit housing development and management. Mark Barry is a technology strategist with diverse experience in private firms and in the public sector. He currently manages capital project data and controls for Chicago Public Schools. Previously, hefounded Chicago Energy Technology, an advisory firm for smart systems and energy efficiency; led IBM's consulting business for state and local government in four states; advised leading corporations on technology strategy; and served as Chief Information Officer for three firms. He started his career in consumer packaged goods, logistics, and operations. 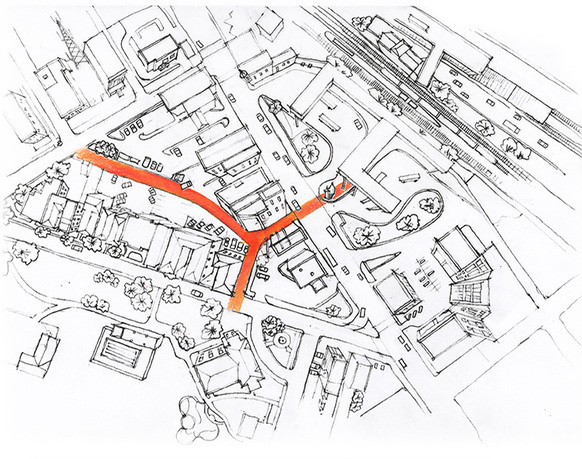 Nilay Mistry has executed placemaking projects across the world. His work seeks to expose networks and material flows in the urban landscape. He holds degrees from the Harvard Graduate School of Design and the University of Illinois and has been visiting faculty at Chulalongkorn University in Bangkok, Thailand. His ongoing research has led to numerous community involvement and construction initiatives in the United States, Asia, and Africa. With experience in various exhibit design projects, Thomas Chiu is particularly drawn to using spatial experience for storytelling. Involved in nonprofit organizations like Architecture for Humanity Chicago, he is committed to improving neighborhoods through design proposal that converse with communities. Chiu graduated from the School of The Art Institute of Chicago with a bachelor’s degree in interior architecture. Hilary Gabel oversees operations, communications, and marketing for Archeworks’s educational programs and urban design initiatives. Previously, she managed the Early College Program, a high-school program in art and design at the School of the Art Institute of Chicago. She was also involved in the launch of an art gallery in Chicago, where she managed operations and participation in several large-scale, international art exhibitions. She earned her BFA from Illinois Wesleyan University. Founded in 1994, Archeworks is a Chicago-based multidisciplinary design school with a social agenda. 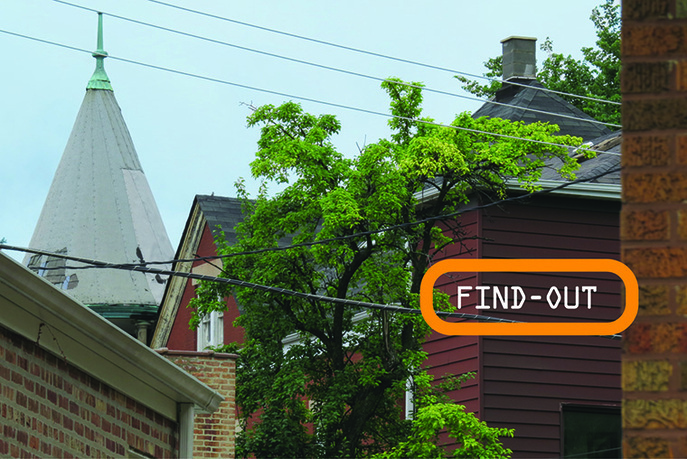 Our public forums and partnership-based education programs propose a range of socially responsible and ecologically resourceful design solutions for Chicago communities. Archeworks advances design in the public interest and inspires collaborative action to shape sustainable, equitable, and healthy communities.